Hi Everybody, we have updated all our products (Mindomo Basic, Premium, Business, Education and Desktop) yesterday. We fixed a lot of issues and added some more new features. 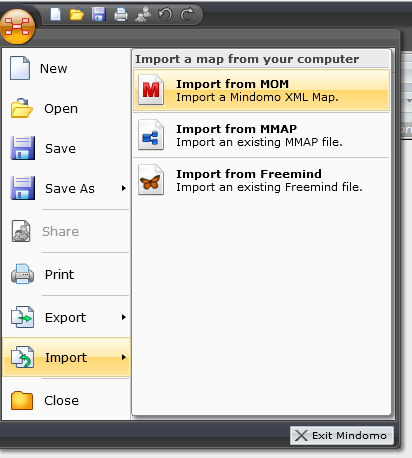 Premium users are able now to save and load their maps into their desktop in Mindomo native format. One important issue is that if you want to change the name of your map during saving you will have to add the .mom file extension manually. This is a limitation which comes from the Adobe Flash player and which we couldn’t overcome. Once you saved a file to your computer, you can open/import it from the same Application Menu . Just select Import from Mom and browse for your file. We fixed a number of bugs signaled by you, in all products. You can find the list in our changelog. i can’t save and load my map on my computer. i’m desesperated. Hello Marie. If you are a free user, you should be able to save your mind map on your computer as .png, .txt or .rtf file. From your mouse, right click on the map > Download > choose the format that you want. Please let me know if there is anything else I can help you with.